The Vickers Mk.VIA AA Mk.I is a Rank I British self-propelled anti-aircraft gun with a battle rating of 1.0 (AB/RB/SB). It was introduced in Update 1.79 "Project X". 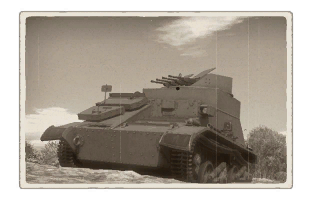 This tank makes for a good entry level AA vehicle; Good speed, manuverability and a devastating short to medium range AA attack. This vehicle should be used in the rear end of an assault, watching the skies for incoming bogies. However the real ace is that the guns lack accuracy but trade-off for a sheer volume of fire, filling the skies with a hailstorm of bullets that can discourage bandits from lining up on an attack run. However anything beyond effective range won't be struck down effectively. Describe armour protection. Note the most well protected and key weak areas. Appreciate the layout of modules as well as the number and location of crew members. Is the level of armour protection sufficient, is the placement of modules helpfull for survival in combat? The key to playing this vehicle effectively is by being patient. Wait until your target is nice close and then let loose. The four machine guns will shred enemy bogies if you aim well so try and nail him before he has a chance to dart out of range. Avoid engaging enemy aircraft at long range as the drop-off goes away out of effective range; Not only will you give away your position, the enemy will be very likely to hunt you down and it won't fare well against a direct confrontation with ground units. Great placement as a Rank I SPAA. 4x BESA machine guns means a high ammo load and a good rate of fire. 4x machine guns means that you have a high hit probability. Armour provides some protection from machine gun fire, though the gunner is vulnerable if hit. Excels at taking down fighters. Can be used against low tier SPAA and open top tank destroyers, however, it is best suited to strictly SPAA duties. Cannot defend itself from ground attacks, all belts cannot penetrate any tanks. Damage output is no where near comparable to SPAA armed with 20mm auto cannons at this tier. The gunner is exposed to machine gun fire from above and the front. The armour will not protect you from 12.7mm rounds and above. This page was last edited on 10 February 2019, at 18:54.